A chorus line of dancing knights, flatulent Frenchmen, killer rabbits and one legless knight will take to the Theatre at the Mount stage duringMonty Python’s Spamalot, August 9 – 18. Monty Python’s Spamalotis the winner of three 2005 Tony Awards including Best Musical and Best Director, as well as the Drama Desk and Outer Critics Circle awards. Taking the stage as King Arthur is Will Gelinas who is joined by Angela Jajko as The Lady of the Lake. Other members of the cast include: Christiaan Stone as Patsy, John Bubello as Bedevere, Doug Dame as Lancelot, Andrew Kelley as Galahad, Kyle Kasabian as Herbert and Justin McCoubry as Robin. Performance dates are: August 9, 10, 16, 17 at 8PM and August 18 at 2PM. 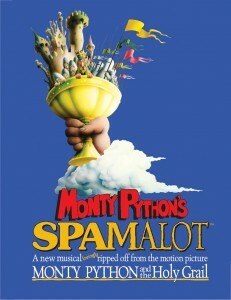 Tickets for Spamalot are available at www.mwcc.edu/tam, by calling 978-630-9388 or in person at Theatre at the Mount, 444 Green Street, Gardner, MA. Box Office hours are 9:30 a.m. to 12:30 p.m. and 1:30 p.m. to 2:30 p.m., Monday through Friday.